This article is NOT about peloton riding… Here we look at riding in less formal groups, much like we enjoy on Easy and Medium Bike North rides. How is a group of cyclists different from a lone rider? Of course, it depends what you mean. First of all from the perspective of the cyclists within a group it is very different. Other riders can get in your way, do unpredictable things, or ride too close or too far off the back of the group. From the point of view of a motorist though it is almost the same thing. Motorists expect that a group of cyclists will all do the same thing at the same time. They do not see individuals, but a single group. This must become our guide as to how to ride in a group, at least when on the road. On shared paths things are a little different due to much lower speed, smaller spaces, and the unpredictability of pedestrians. As a rider within a group you have responsibilities beyond those you might have as a lone rider. In my view the most critical of these is to be predictable. Predictability relies on repeated or learned patterns of behaviour. Since individually we all behave differently, this means that in a group some Norms need to be set. Who is this guy called Norm? Ride at a safe distance from the rider ahead of you. Naturally this distance will vary according to conditions such as road or path surface, speed, and skill levels, but as a rule of thumb one bike length would be a good distance to work with. If you find this uncomfortably close then move back a little more, but start training yourself to ride a little closer until it feels easier. As with anything, a bit of practice and application to the task makes all the difference, and of course you can always ask for help from a more experienced rider (a ride leader for example). A point worth noting here is that it is a rider’s responsibility to keep up with the group. It may take a little extra effort now and then, but everyone in the group benefits. If a rider is having real problems with the pace, the ride leader will dive into his/her bag of tricks, and decide on the best way to manage the difficulty. Riding two abreast is allowed on multi-lane roads, and is often the best way to ride because it gives the group greater visibility but also because it forces motorists to pass in the adjacent lane leaving a safe passing distance. The same rule applies as with riding behind someone: not too close, not too far away. Touching shoulders would be too close, unable to reach the other rider with your arm outstretched would be too far apart. Ride in straight lines. It may seem a little superfluous to say this, but the number of cyclists who cannot hold a straight line is surprising. Having a rider in front of you or beside you wobbling the handlebars all over the place is very disconcerting. Of course this is a matter of personal practice away from the group. I like to use road line markings to practice on. Once you are confident at moderate speed (20km/hr) try it one handed, then try it slower. Then try it with the other hand only. Slower still. It’s more difficult the slower you go. On many Bike North rides I have had to ride very slowly indeed, with other riders around me, while those ahead negotiate a squeeze point or difficult turn. 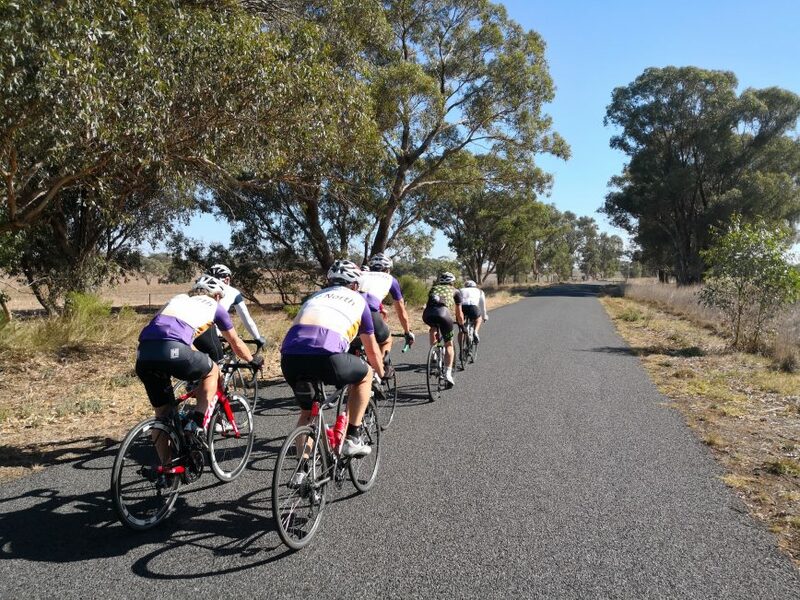 Groups have an elastic effect – the people at the back have to ride slower when the group slows and faster when the groups speeds up, so riders at the front need to be aware that those behind have still to complete the manoeuvre. Do not make any sudden moves! A sudden turn, a sudden stop or braking, a sudden sprint, sudden cessation of pedalling (this is subtle but very important) could all cause trouble within the group and even cause an accident. If you need to make some unusual move, indicate it clearly or call out, and make sure it is safe and that the group understands before you execute the manoeuvre. Be aware of the actions of others in the group. Being observant about how others ride, where in the group they ride, what skill levels they have, and what potential there is for a problem to occur is the job of every member of a group. Having a chat while riding is one of those things we all enjoy. There is nothing wrong with having a chat, but do not keep looking at the other rider! Keep your eyes on the action ahead and to the sides, keep scanning the path and do not allow the conversation to impede your judgement or reaction time. This becomes particularly important when the group has to negotiate some obstacle or intersection. The saying “hold that thought” comes to mind, as conversations on the bike are often fragmented. Intersections and obstacles present extra challenges. Even if others have assured you it is safe to proceed across the intersection, or to make the turn, you must take responsibility for your own actions. Look and make sure that it is safe to proceed. Just because the person ahead of you has negotiated whatever it is does not mean that there isn’t a B-double about to come the other way. Less likely is a giant whale falling from the sky of course. It is so easy while riding along in a group to forget about how the group as a unit is behaving. One of the many jobs a ride leader has is to keep the group operating in such a way as to be courteous to other road/path users, to obey all applicable laws, and to put safety first. This job is made so much easier if each member of the group is aware of possible problems – is the group strung out too far? Are some people riding three abreast? Are some people riding on the wrong side of a shared path? Does the group as a whole look and behave as a single unit? The bigger the group the harder it is for a ride leader to manage all this, and the more important it becomes for each rider to do the right thing. Other road and path users soon become annoyed by what seems to be a rabble of riders, but a well formed group will cause no angst. How the group looks can be just as important as how it is operating. Often I have seen a Bike North group from the sweep’s position and it sometimes looks as if the road is littered with cyclists – all very colourful, but anarchic. Riding two abreast is one thing, but if one pair is on the road edge, and the next pair is hugging the double line, it looks like three or even four abreast from behind. Its important to ride directly behind the rider in front of you, not offset to the side, whether two abreast or in single file. On that point one of the most dangerous things a following rider can do is to ‘half-wheel’. This is when a rider follows another, but sits to one side and overlaps his/her front wheel with the leading rider’s back wheel. Never do this. If the leading rider moves just a little to one side (to avoid debris for example) the overlapping rider will come down. One excellent tool a leader can use to help manage a group is hand signals, sometimes accompanied by voice calls. Different groups use different conventions but in Bike North we have developed a pretty good and fairly standard system. We encourage you to learn the calls and what action to take. For further information see the Bike North Ride Participants guide below.